All of us experience fear from time to time. Certain situations can arouse anxiety in some of us. The question is how can we overcome those uncomfortable emotions? First step- Don’t deny your fear or anxiety. Keep in mind that denying an emotion isn’t going to make it go away. When you know that fear is a natural response to certain situations in life, you become more tolerate towards it. You wish it to vanish, but in order for that to happen, you shouldn’t fight it. Recognize that there is a fear and accept it. This fear can’t hurt you in any way and therefore there is no need to fight it. In most cases, we choose to fight our feelings and get angry at ourselves. This approach can only intensify the unwanted emotion. Example- let us assume that you are headed toward a job interview and that you are eager to get the job. You are excited and you fear whether or not you will get the job. You know that you need to think clearly and impress the interviewer in order to get this competitive position. One possible response is to get angry at your fear. You try to reject your fear and calm yourself for the interview, but the harder you push against your fear only intensify it. The second possible response is to accept that there is a fear. 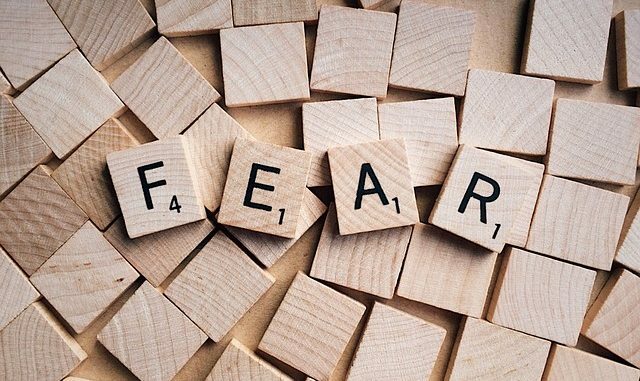 You can remind yourself that it is only natural to have a certain amount of fear before an interview. You can also remind yourself that no matter what happens, you will still remain the same and the people who love you, will continue to love you, no matter what. When thinking at this manner, it is possible to diminish the fear and have a much more positive attitude towards the interview. Second step- Analyze the situation. Is there really a reason to be afraid? You should analyze the situation. Remind yourself that a job interview, a date, an important test or any other situation that might cause you to be afraid, can do no harm for you. On the other hand, a hurricane, a tsunami or an earth quake can sometimes cause a lot of harm. In those cases a certain amount of fear, can help the person that is in danger to function more rapidly. The “fight or flight” response that is felt during fear or anxiety, was supposed to help us survive dangerous situations. When encountering a real danger, the “fight or flight” response that we feel, can make us ran more fast or do anything much more efficiently. Therefore this response was “designed” to help us. The problem is that in our days, we seem to see many situations as fearful ones. We need to stop and think, if there is really something to be afraid of. Third step- You need some positive thinking. It is well known that positive thinking is an efficient antidote for fear. When you see all the positive aspects of your life and give thanks for them, you will feel that you are lucky. Feeling this way will cause you to seek more proofs for being lucky. That will cause you to see your life as an adventure with good surprises, instead of a long route with bad things that might happen to you on the way. It is all a matter of perspective and you can choose in which manner to see things. Becoming more positive isn’t something that is done instantly. But, cultivating more and more positive thinking can help you see your life in a much brighter perspective. For conclusion, I can only wish you success and happiness. You can read more on bad habits and how to get rid of them. Feel free to write your opinion in the responses.